Ostomy Bags are often referred to as ostomy pouches or ostomy appliances. They come in three different types and with numerous options. The three types of ostomy bags are colostomy bags, ileostomy bags and urostomy bags. A colostomy is a surgically created opening into the colon through the abdomen. It allows stool to bypass a diseased or damaged part of the colon. An ileostomy is a surgically created opening into the small intestine through the abdomen. An ileostomy allows stool to bypass the lower intestines. A urostomy is a surgically created opening usually on the abdomen. After the bladder has surgically been removed, urostomies allow urine to flow out of the body. This article will examine the criteria used for selecting an ostomy product to meet the most common needs of ostomy patients. When you have narrowed down the options to a few best choices, check out the FREE Ostomy Bag Samples available from several different manufacturers at the bottom of this article to test the products that best meet your needs! Selecting the Right Ostomy Bag is not always quick and easy. New innovations and technology have combined to provide many new options. Choosing the right ostomy bag will depend heavily upon a number of different factors. Some of these factors include the type of ostomy, patient lifestyle, daily activities, personal preferences, skin condition, and budget. Below are some quick links to sections of this article that may be of immediate interest to you. One-piece Ostomy Bags advantages and disadvantages. Two-piece Ostomy Bags offer less frequent skin barrier changes. Drainable or Closed-end Ostomy Bags benefits. Pre-Cut or Cut-to-fit Ostomy Bags summary. Opaque or Transparent Ostomy Pouch comparison. Flat or Convex Ostomy Bags advantages. Filtered Ostomy Bags for odor management. Multi-Chambered Ostomy Pouch for less noise and less sloshing. Mini Ostomy Bags for more discreetness. Moldable Ostomy Pouches to provide a snug fit on irregular stomas. Ostomy Belts for increased security. Ostomy Pouch Options matched to brands/manufacturers. Best Ostomy Bags offers a list of the top selling pouch systems. Free Ostomy Bag samples from best selling manufacturers. Ostomy Research Studies conducted by medical professionals and scientists. Most ostomy bags are designed for a specific stoma. Colostomy bags are designed to work with a colostomy stoma while ileostomy bags are designed for an ileostomy stoma. A colostomy bag is constructed to handle solid waste and usually can be irrigated or drained easily. An ileostomy bag is designed to collect stool and digestive enzymes. Urostomy bags are used to collect urine. Ostomy bags are available with flat skin barriers, convex wafers or for special fitting requirements, moldable skin barriers. There are multi-chambered ostomy bags and mini pouches that are more discreet and useful for sports and active lifestyles. Filtered ostomy bags are handy for bathing or swimming. Ostomy bags equipped with belt tabs attached to an ostomy belt help support the weight of the bag. Numerous options are available to help meet your specific needs. There are several differences between a one-piece ostomy bag and a two-piece ostomy bag. The infographic below displays some of the key differences in these two types of ostomy bags. In order to wisely discern which bag is best for you, take a few moments to consider some of the advantages that accompany these two different types of ostomy bags. A one-piece ostomy pouch provides a more discreet profile than a two-piece pouch. One-piece ostomy bags are often nearly invisible beneath clothing. For people who wear form-fitting clothes or who participate in sports, a one-piece ostomy pouch might be the ideal choice. In a one-piece system, the flange cannot be separated from the ostomy bag, resulting in a more secure user experience. However, a one-piece ostomy bag requires that the ostomy wafer and bag combination be changed at every bag change. Frequent ostomy appliance changes have the potential to cause skin irritation for some users. Furthermore, when you change the bag on a one-piece system, everything must be positioned around the stoma just right to prevent leaks. This positioning can be somewhat time-consuming. With a one-piece unit, you are likely to use more skin barrier pastes, tapes and adhesive removers than you would with a two-piece unit. The frequent use of these materials can add additional expenses to your budget. The ActiveLife One-Piece Drainable Cut-to-Fit Pouch with Stomadhesive Skin Barrier is a good example of a one-piece ostomy system. There are several advantages to investing in a two-piece ostomy system. With a two-piece ostomy bag, the skin barrier, often referred as a flange or wafer, can remain in place for two to four days. Less frequent skin battier changes is gentler on the skin. Frequent changes required by a one-piece system are often too much for sensitive skin. With a two-piece system, you can easily change the size of the bag you are using without removing the skin barrier. You can conveniently switch to a smaller bag for intimate moments or for swimming and effortlessly slip on a regular-sized bag for everyday activities. At night, a larger bag can be used. Ostomy bag changes with a two-piece system are much quicker and easier than a one-piece system, which is ideal for people who lead an active and engaging lifestyle. Some of the disadvantages of using a two-piece system include bulkier size, more prone to leaking, and slightly more expensive than one piece systems. Although more expensive, the two-piece system can be less expensive in the long-run if significant quantities of tape, adhesive removers, and barrier pastes are required for skin care and stoma sealing with the one-piece ostomy bag. 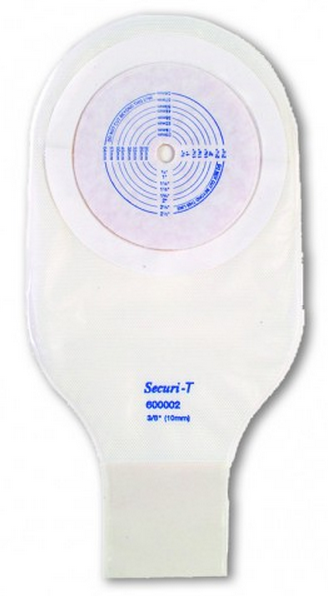 An example of a popular two-piece ostomy bag is the Click MIDI Opaque Drainable Pouch. Choose the ostomy bag that you not only feel comfortable with, but is well-adapted to your everyday lifestyle and activities. Many people find that it is convenient to have both types of ostomy bags on hand to suit different types of situations and activities. This strategy offers the most flexibility and adaptability. Drainable pouches are available in both one-piece and two-piece pouches. A drainable pouch allows users to empty the contents of the pouch and then reuse the pouch. Primarily, people with ileostomies or whose stool is semi-formed, drainable pouches are a better choice because they require fewer changes than closed-end pouches, are easy to empty and ideal for people with liquid or semi-solid waste output. Closed-end Pouches, which are also available in one-piece or two-piece systems, are not reusable. Closed-end pouches are thrown away once the pouch is full. These closed-end ostomy bags and are ideal for formed, solid waste output. Many manufacturers make flushable pouch liners, which are ideal for people who lead a busy lifestyle and who do not have time to empty and clean a pouch. Closed designs are common for colostomy bag users. A colostomy bag is often attached to either an upper or lower area of the colon and depending on the location the consistency of the output will be different. For a closed colostomy bag, solid waste collection is usually preferred. That means there is no need to clean the colostomy bag, and it can simply be detached and thrown away. Fitting the skin barrier snugly around the stoma minimizes leaks and the risk of damaging skin. The more secure the ostomy pouch, the lower the risk of leaks. A pre-sized barrier is an opening in the flange that is already cut to the size of the stoma. Size options are listed for each ostomy pre-cut pouch to allow selection of the correct size barrier for your stoma. For stomas with a evenly round shape, a Pre-cut Ostomy Bag is the best choice. A cut-to-fit barrier is ideal if the stoma is still changing sizes or if the shape of the stoma is not round. A cut-to-fit barrier requires cutting the skin barrier before it is applied to the body. Some cut-to fit ostomy bags have a small starter hole in the center of the skin barrier where scissors can be placed to start cutting to the the right size. Below is a chart displaying the key advantages and disadvantages of Pre-Cut vs. Cut-to-fit Ostomy Bags. 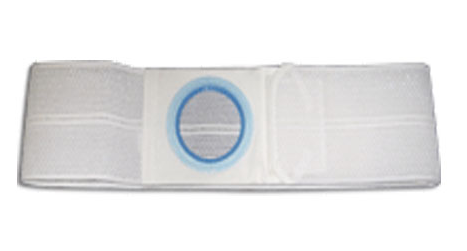 Opaque ostomy pouches are more user friendly, offering more discreetness than transparent bags. Usually beige in color to more closely match skin color, opaque bags are designed to conceal the contents of the pouch. A transparent ostomy pouch allows you to see into the bag to view its contents. Transparent bags are caregiver friendly and are easier to check. Transparent pouches are most often used for wheelchair and hospital bed patients and offer less patient intrusion. Below is a brief comparison chart of these two types of ostomy bags. The majority of ostomy pouch flanges are flat, but many ostomy patients prefer or require a convex flange. 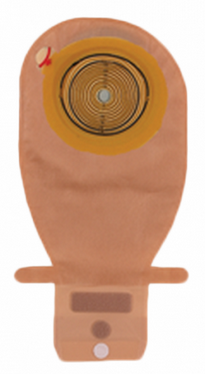 Flat Ostomy Bags have a flat adhesive back, allowing the bag to be in position with little protrusion. Flat appliances offer more discreetness. Convex Ostomy Bags have a back which protrudes out giving the flange a stepped side-profile appearance. Convex ostomy bags are available in both two piece and one piece products. Convex bags come in fixed and non-fixed options. A fixed convex pouch is designed, strengthened and molded into a stepped shape. Fixed convex flanges are less flexible than traditional flat flanges. The Non-Fixed range of convexity products are usually based around plastic rings which clip into existing traditional flat/non-convex product ranges to give them a shallow convex step. Non-fixed convex products are considered more gentle, softer and flexible, allowing more flex with your body. There are also three different levels of curvature for convex bags--shallow, moderate and deep. The combination of these options give ostomy patients more choices, and flexibility, over which convex product would be best. Convex pouches offer added security and skin protection for recessed, retracted and flush stomas. Below is a chart comparing the advantages of convex and flat ostomy bags. 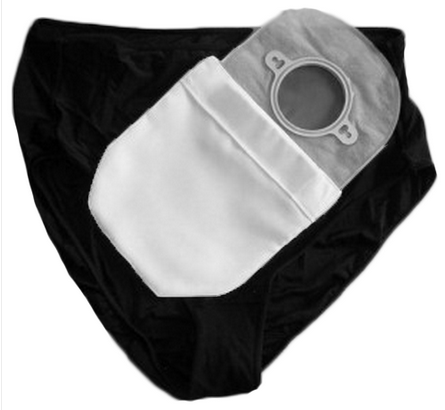 Ostomy bags with filters allow the the bag to vent while filtering the gas to remove any odor. Gas and odor are often associated with stomas. An ostomy filter is usually made of charcoal with microscopic holes and membranes. Ostomy bags that incorporate an integrated filter allow patients to bathe, swim or participate in athletics with a much lower risk of leaks. Performance of these filters varies from manufacturer to manufacturer, so you may want to try a number of different manufacturers to see which one works best for you. Multi-chambered ostomy bags reduce the amount of sloshing within the bag to reduce noise and provide a more discreet wear. These chambered ostomy pouches are a favorite for ostomy patients that are very active and participate in sports and athletic events. Mini ostomy bags have a smaller capacity but offer more discreetness. Their smaller size is less detectable and more comfortable to wear. Smaller also means less weight, but also less capacity. Ostomy bags with moldable flanges are an innovation of Convatec. A moldable skin barrier not only allows a snug fit around an irregular shaped stoma, but also helps reduce the risk of leaks. Below is a video from Convatec that demonstrates the advantages of a moldable ostomy appliance. Following the video is a chart that summarizes the advantages and disadvantages of a moldable ostomy pouch. An ostomy belt is designed to support the weight of the pouch and to fix ostomy appliances in place. They also help to conceal the ostomy appliance and protect the appliance from being jarred loose from incidental contact with the world around you. Ostomy belts keep your pouch in place to prevent leaks. Vitality Medical provides a list of manufactures that offer specific ostomy bag options that may be of importance to you. This Ostomy Bag Options List displays alternatives like multi-chambered ostomy bags, filtered ostomy bags and moldable skin barrier bags along-side the manufacturers that make them. The Best Ostomy Bags listed by highest sales volume can also be examined. For new ostomy patients, it can be a challenge to find an ostomy appliance that has a special feature that your are looking for. Below is a chart of special ostomy features matched to manufactures and brands to help you begin your search. What is the Best Ostomy Bag? Ostomy bags are constantly changing with new technology and new designs. Construction materials and features for ostomy appliances are always improving. To determine which ostomy appliances are the best, we examined consumer voting. Consumers vote by their purchases. Consumers tend to purchase the best product that offers the most value for their money. The chart below displays the best selling ostomy appliances by category. Coloplast Ostomy Bag Free Samples request form. Convatec Free Ostomy Bag Samples with drainable and filtered ostomy bag options. Cymed Free Ostomy Samples of 1-piece and 2-piece ostomy bags. Free Eakin Ostomy Supplies offers samples of cohesive ostomy seals. Genairex Free Ostomy Bag Samples, including the made in the USA Securi-T branded ostomy products. Hollister Free Sample Ostomy Pouch and other ostomy supply samples. Marlen Ostomy Pouch Free Samples for colostomy, urostomy and ileostomy. Nu-Hope Free Sample Ostomy Supplies, including colostomy, ileostomy and urostomy samples. Nybæk, H., Knudsen, D. B., Laursen, T. N., Karlsmark, T. and Jemec, G. B. E. Skin Problems in Ostomy Patients: A Case-control Study of Risk Factors. Acta Dermato Benereologica, Acta Derm Venereol 2009; 89: 64–67. Lyon CC, Smith AJ, editors. Abdominal stomas and their skin disorders. An atlas of diagnosis and management. London: Martin Dunitz Ltd, 2001: p. 161. Ratliff CR, Scarano KA, Donovan AM, Colwell JC. Descriptive study of peristomal complications. J Wound Ostomy Continence Nurs 2005; 32: 33–37. Hellman J, Lago CP. Dermatologic complications in colostomy and ileostomy patients. Int J Dermatol 1990; 29: 129–133. Arumugam PJ, Bevan L, Macdonald L, Watkins AJ, Morgan AR, Beynon J, et al. A prospective audit of stomas-analysis of risk factors and complications and their management. Colorect Dis 2003; 5: 49–52. McNamara RJ, Farber ME, Roland SI. Dermatologic changes in the circumileosyomy skin. Calif Med 1959; 91: 16–20. Burt-McAliley D, Dberhardt D, Rijswijk LV. Clinical study: peristomal skin irritation in colostomy patients. Ostomy Wound Manage 1994; 40: 28–30. Rolstad BS, Erwin-Toth PL. Peristomal skin complications: prevention and management. Ostomy Wound Manage 2004; 50: 68–77. Cottam J, Richards K, Hasted A, Blackman AJ. Results of a nationwide prospective audit of stoma complications within 3 weeks of surgery. Colorectal Dis 2007; 9: 834–838. Herlufsen P, Olsen AG, Carlsen B, Nybaek H, Karlsmark T, Laursen TN, et al. Study of peristomal skin disorders in patients with permanent stomas. Br J Nurs 2006: 15: 854–862. Robertson I, Leung E, Hughes D, Spiers M, Donnelly L, Mackenzie I, et al. Prospective analysis of stoma-related complications. Colorect Dis 2005; 7: 279–285. Martin JA, Hughes TM, Stone NM. Peristomal allergic contact dermatitis – case report and review of the literature. Contact Derm 2005; 52: 273–275. Borglund E, Nordstrom G, Nyman CR. Classification of peristomal skin changes in patients with urostomy. J Am Acad Dermatol 1988; 19: 623–628. Once you have become used to living with an ostomy bag, the daily life routine becomes easier to handle. Traveling with an ostomy appliance however, might require special care and attention, on an entirely new level. If you are planning to travel, there are some important tips you need to keep in mind, to ensure a hassle free and comfortable traveling experience. You will be denied the right to carry a pair of scissors during travel, therefore it is important that you prepare before hand to avoid any inconvenience later. Make sure that you pre-cut all the ostomy pouch bags while at home. With no scissors allowed in your carry-on luggage, it will be difficult for you if you are not prepared beforehand. Make sure that you have ample amount of ostomy supplies for your trip. Also, it is very important for you to pack these supplies, both in the carry-on as well as the checked luggage. Never pack the supplies in only one place. It is a good idea to have a written prescription from your physician with you at all times. Also, have your doctor write a statement which advocates the use of a private area or room, in case there is an extended search at customs in the airport. When you travel to a foreign country, it is important that you have all your ostomy case details written in the foreign language. You can seek help from different member associations of the International Ostomy Association, for translating the details of your ostomy condition. They can also help you to procure supplies easily while within a foreign country. There is a book titled "Yes We Can", which offers a number of useful hints as well as traveling advice, with an entire dictionary that contains ostomy terms that have been translated to a number of different languages. You can use such a book to become familiar with the obstacles that you might face and the best solutions. The book also contains critical contact information of worldwide resources, along with a small statement that outlines the request for a privacy search in 11 different languages. One thing that you can do is keep the usage instructions or work details of your personal care products with you at all times. You can carry copies of the equipment usage and instruction pages from different catalogues, to make it easier to explain the working of your different personal care items to security authorities, if necessary. This will help you to prove your need for those products, and also inform the concerned personnel of the actual need for the equipment that you carry around with you. You will be able to avoid lengthy discussions and long hassles that are usually a part of the entire search procedure. By following these tips, you will be able to enjoy a hassle free, comfortable and enjoyable trip, without worrying that your ostomy bag will be bothersome in your traveling adventures.